Sleep is an integral part of our life, and one that many of us take for granted. However, millions of people struggle to get restful sleep, or experience odd symptoms related to their rest periods. A surprising number of people suffer from parasomnias and other sleep disorders. But what are parasomnias, anyways? Learn more below. The parasomnias definition does not include sleep apnea and a few other sleep disorders, which are classified differently. Depending on the specific type of parasomnia being experienced, the symptoms can occur while falling asleep, during non-REM sleep, during deep REM sleep, or while waking. Many cases of parasomnias go untreated, because people simply do not realize that they are experiencing an actual medical condition. In most cases, parasomnia symptoms are not particularly harmful, although they can certainly cause disruptions in ones work and personal lives. In many cases, it’s difficult to identify a specific cause for symptoms of potential parasomnias. Some of these conditions, such as nightmares, are quite common, yet their true causes are unclear. Treatment for these conditions varies depending on the individual symptoms. In many cases, there is no direct treatment, but most of the time, symptoms can be improved by making behavioral changes. Practicing better sleep hygiene by setting a regular sleep schedule, avoiding screen time before bed, etc. can drastically improve symptoms, and even eliminate them completely in some situations. Treatment by a medical professional should be sought out if symptoms become severe, or if there is a danger to the patient or the patient’s sleep partner. This guide seeks to answer the basic question of what are parasomnias – but there’s a whole lot more information out there. This guide at SleepEducation.org is a great place to start. 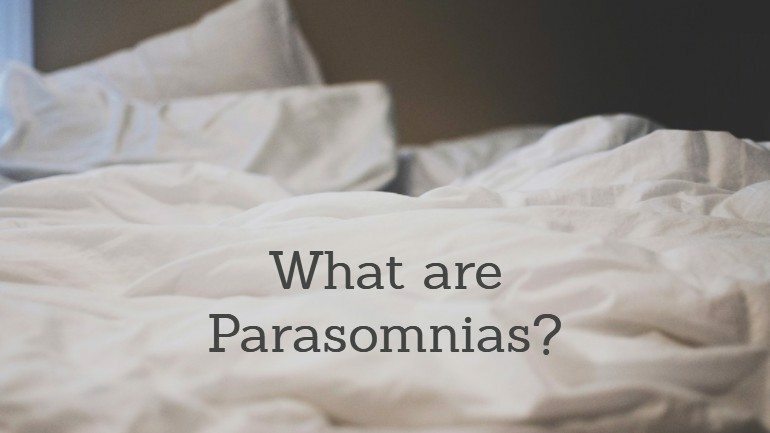 Once you have identified a specific parasomnia that you believe you may be experiencing, it then becomes easier to search for further information on that particular condition. If you have any questions, don’t hesitate to ask!